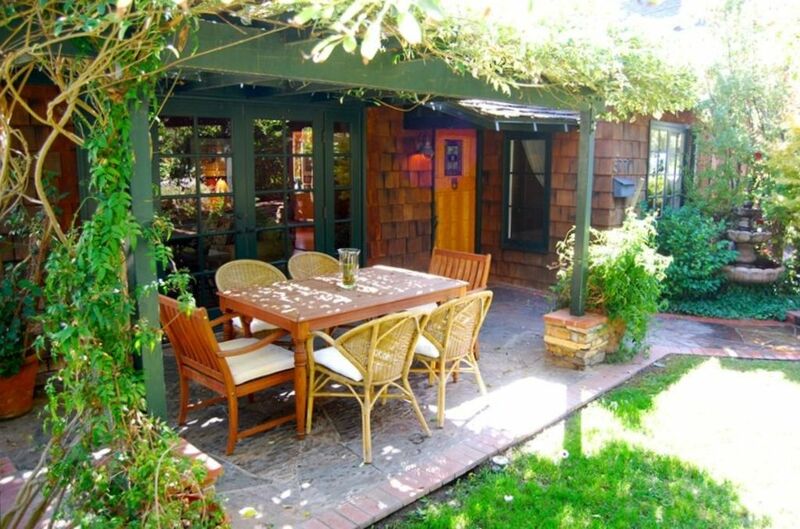 This Wonderful Serene Private Cottage is Set in the Heart of Laguna Village! This Three- Bedroom, Three Bath Home Has a Lot to Offer, Each Bedroom has its own full bathroom. Beautiful Hardwood Floors, Stone Fireplace, and Open Beam Ceilings, All French Windows and Doors. Enjoy the Peaceful Courtyard with flowers and grassy area, BBQ and a Teak Table with six chairs to just sit and relax and enjoy the peaceful ambiance. Private Lush Backyard. Walk to the Beach, Summer Park Concerts, and Laguna Village from This Charming Cottage. The home backs up to a canyon, you can hear the frogs at night and the creek when it rains, very private home and comfortable, clean, clean all new everything. Beach chairs, umbrella, towels and beach toys. Games and kid movies, DVD and VCR, Plasma T.V, Bose stereo system. High speed wire-less internet. Brand new play-pen for little ones, with cozy blanket and sheets all new. The kids room is a dream for little one's, they have their own bathroom with bathtub, I re-did all the bathrooms in this charming cottage, they are all brand new and very unique. The kids room also has a walking closet with toys and books, a patio off their bedroom that backs up to the canyon, you can hear at night the frogs, the jasmine smell travels to the patios. As you sit and relax in the front Courtyard, the kids can play in the grassy area, private courtyard and backyard too. This home is very special, you will enjoy the home as much as we do. The bedroom with the twin beds it's a few steps from main level...master bedroom another few steps. This home is a Tri-level. *No parties, this is our home. Village area...walk to many restaurants, boutiques, galleries, coffee shops, grocery store, down town and the beach. Amazing location! toilet, shower, Beautiful bathroom with shower. toilet, combination tub/shower, Beautiful bathroom. Village area..walk to many boutiques, restaurants, coffee shops, galleries and the beach...all within steps. Four blocks to the Beach! Amazing location. Quiet street...walk to many restaurants, shopping, galleries all within just a few minutes from the cottage. Laguna Beach Village Location. Cozy Living room with Canyon Views. Comfortable couch with flat screen T.V. Surround Stereo. Beautiful Kitchen with French windows through out, hardwood floors. Brand new fridge, antique stove. A few books for you to read in the cozy Fireplace room or Living room. Toys and books in second bedroom. An amazing home in a quiet street...close to beach and restaurants. Village location. Walk everywhere. We have been coming to Laguna Beach for several years and this location was one of the best. The lot is very private, overlooking Bluebird Canyon. It is about 5 blocks from the beach and about a mile from the downtown. We walked our dog to downtown and back everyday. We had guests during our stay and the house accommodates 6 people very comfortably. Each of the bedrooms and bathrooms are on a different level. Carmen was very good to work with. She responded immediately when a few light bulbs needed to be replaced. We thought that the rental price was very reasonable for pricey Laguna Beach. We would definitely rent this cottage again. I am so happy that you and your family enjoyed your stay at Calliope Cottage and Laguna Beach. Our stay marks the third year we stayed for a winter month in Laguna Beach. The cottage was quite large and well located. Unfortunately, we started our visit having cold wet weather. Although Carmen cannot be responsible for the weather, the cottage has a poor heating system. You can make the Living Room area 75 degrees but the master Bedroom is a maximum of 62 degrees. The first week was uncomfortable. Other than the heat we enjoyed our stay. Thank you for letting me know about the heat not heating the master bedroom to no more than 62 degrees. My handyman Candelario has checked the heater system in the whole house and has fixed the issue. My family -- husband, son, daughter-in-law, two grandchildren, and myself -- have now enjoyed three vacations in this lovely house. It is cosy, quiet, comfortable, and tasteful in all its details. A short walk to the beach and to restaurants, it is also a green oasis. Nothing is better than an outdoor meal under the pergola in the front garden. It is becoming a family favorite getaway location -- close to my son's suburban house but a world away. From kids to grandparents we all love our time here. Very comfortable home in a great location. It was clean, well kept, and serene. Nice escape. Owner is very helpful and motivated. My family and I had a wonderful stay in Laguna. The house was perfect for our family with three bedrooms and three full bathrooms! Great location next to a wonderful Park and not too far from town. Everything worked excellent and was all very clean and nice. Perfect getaway in quiet neighborhood of million dollar cottages just blocks to a secluded public beach. Not spotless, but that has more to do with housekeeper than owner. Minutes from yoga, minutes to a secluded park, plenty of common area and secluded baths. Plus very responsive owner. Love this place and hope to come back next year. The kids room also has a walking closet with a few toys in there and they also have their own patio off their bedroom that backs up to the canyon, you can hear at night the frogs, and the Jasmine smell. Lot's of brand new stories for the little one's and games. As you sit and relax in the front Courtyard, the kids can play in the grass area, private courtyard and backyard too. This home is very special, you will enjoy the home as much as we do. Absolutely NO parties. We have a great relationship with our neighbors and we would like to keep it that way. Your contract is immediately VOID if there is a party and you will need to leave the cottage immediately. NO EXCEPTIONS. 50% to book and the remaining balance to be applied sixty days before arrival.